If you’re on the defensive side of the game, you might want to take a look at the new Maverik Tank lacrosse head. The Maverik Tank lacrosse head is engineered to be the ultimate defensive machine. It’s design allows for both power and agility, making strong checks and scooping ground balls an effortless afterthought. Maverik’s Tank lacrosse head has a level 5 bottom rail. This means it’s designed for a high pocket which will deliver instant control off the ground. A 4-strut design adds to the strength and rigidity of the Tank head, so it supplies maximum stiffness and rail support. A wide face on the Tank head was used in order to help with intercepting passes. Additionally, multiple stringing holes are included for custom pocket options. The Maverik Tank lacrosse head is made in the USA, and available in a universal spec. It comes in your choice of three colors – white, black, or grey. The Tank lacrosse head can be purchased from Amazon.com with free shipping for Prime Members, and costs only $89.99. Head on over to Amazon to grab yours today. Check out the new Maverik Tank lacrosse head below and drop us a note in the comments with your thoughts. If you own a Maverik Tank head already, let us know how you like it! 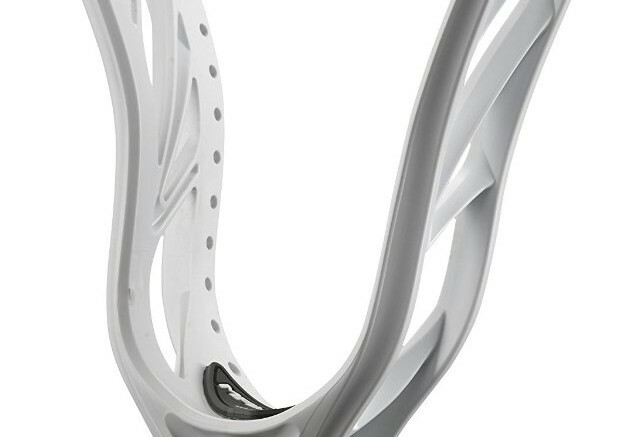 Be the first to comment on "Maverik Tank Lacrosse Head"